The heart of a Tibetan Buddhist temple is filled with incense, smoke, candles, worshippers, and a darkness that oppresses the spirit. As an American I feel I have been fed a glamourized view of Buddhism, imagining a religion of deep thought, calming practice, and inner peace. What I found instead was a system of belief oppressive in physical, emotional, and spiritual realms. Physically, Buddhist monasteries contribute little to the surrounding community, instead exacting enormous religious “tax” upon an already poor populace. Emotionally, I have never encountered a people so dedicated to their religion or striving so mightily to obtain their Nirvana. There is no peace here. Spiritually, Tantric Buddhism is very dark, having ties to the Occult. It leads its followers from darkness into greater darkness in the name of enlightenment. If you walked with me into the soul of this Buddhist temple you would find it very difficult to breathe. The incense and smoke are so thick that your eyes burn as they strain to see through the murky light. 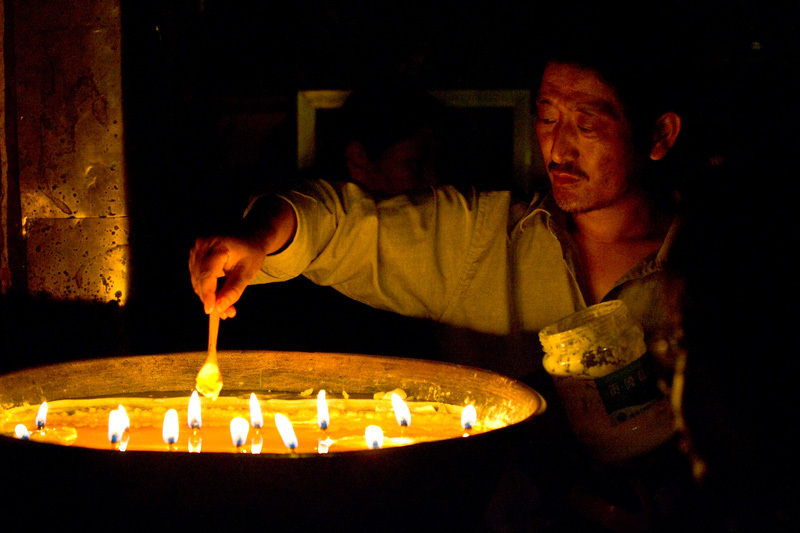 Everywhere you look, you see people like this man, offering up yak butter from containers into the myriad of candles. Others spin prayer wheels, deposit money, or recite their prayers before countless images of ancestors, sages, and deities. You may not even notice, but you would also find it difficult to think. Even as the incense muddles the air, so the spirit world is filled with forces that cloud the mind, making clear deliberate thought a chore, and the entertainment of any opposing religious thought well nigh impossible. Excellent post, Rowan. It makes me so, so grateful for Christ. Thank you for the tour, R! It's amazing how the enemy is limited dressing the same old lies in different clothes...it's sad to see how well it works for him, but praise God for His unshackling Word of Truth!! I appreciate the way you've depicted Buddhism as it is. We in America rarely hear of the darkness that is the core of this religion. I'm so glad that I have a God that I can worship and reverence, but who is also the best friend I could ever have.